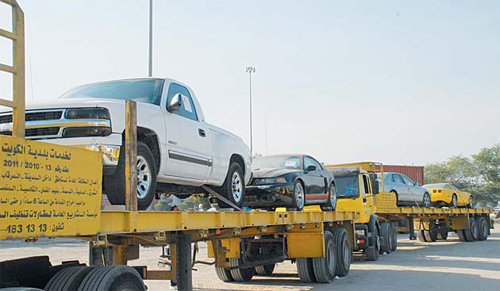 Surprise traffic checks: In coordination with Kuwait Municipality, the Interior Ministry launched a surprise traffic campaign in the Capital and issued 110 violations, impounded 29 vehicles to the garages of the Municipality and 3 vehicles to the ministry garages, in addition to 7 heavy duty trucks. In this context, Interior Ministry’s Assistant Undersecretary for Traffic Affairs Major General Abdullah Al- Muhanna said similar unexpected campaigns will continue in all parts of the governorates in coordination with concerned authorities. Supervisor in sanitation at Capital Municipality Mishal Al-Azemi said personnel from the sector placed 70 stickers on vehicles abandoned at public parking lots after their owners defied warning to remove them from the location, while 40 violations were issued for sanitation.